HomeCare's HomeCaring Awards were created on a simple premise to recognize distinguished service to the home medical equipment community. This year, the magazine has recognized three outstanding individuals whose efforts on the industry's behalf certainly have distinguished them at the highest level: Rita Stanley Hostak, vice president of government relations for Sunrise Medical, Longmont, Colo.; Michael Marnhout, president and CEO of Bluegrass Oxygen, Lexington, Ky.; and Randy Wolfe, president and CEO of Lambert's Health Care, Knoxville, Tenn.
Co-sponsored by Medtrade, the awards were presented at Medtrade 2005 during the trade show's Welcome Reception, held October 18 in Atlanta. The three recipients were chosen from nominees submitted by HomeCare's readers and judged by a panel of seven industry professionals, including: Jerold Cohen, president, Caesar Cohen Ltd.; Louis Feuer, president, Dynamic Seminars & Consulting; Miriam Lieber, president, Lieber Consulting; Simon Margolis, vice president, National Seating & Mobility, and past president, Rehabilitation Engineering and Assistive Technology Society of North America (RESNA); Sheldon "Shelly" Prial, Prial Consulting; Wallace Weeks, president, Weeks Group; and Colette Weil, managing director, Summit Marketing. "Members of the HME industry serve with mercy, mission and perseverance. The nominations are a testimony to the hard work found in every aspect of our business," said Weil on behalf of the judging panel. Working in her role since 1993, Rita Hostak has become a constant voice in industry affairs. She is involved in the industry's Restore Access to Mobility Partnership. She is co-chair of the Program Advisory and Oversight Committee. Anyone who knows Rita, knows that her work as president of the National Coalition for Assistive and Rehab technology knows no bounds. "Rita Hostak is truly one of a kind to this industry. She has been a real leader in the challenges that face all of us, says Sunrise Medical CEO Mike Hammes. Mike Marnhout opened his first home oxygen company in 1982, and since then, has become the go-to resource in his community for any cause, any charity, any patient who needs support. "Of all of Mike's outstanding qualities, service to our community ranks as his highest achievement," reads a nomination letter. "Whether it is providing an indigent patient free oxygen, volunteering his time to help those less fortunate, especially our senior citizens, or assisting a young nursing student by funding their education, Mike's commitment to helping others is widely known and highly respected." Randy Wolfe has participated in the startup of eight HME operations in Tennessee, Virginia, Texas and Florida. He has been a board member and vice chairman of NAMES and has served as president of the Tennessee Home Medical Providers Association. "Lambert's Health Care may be a smaller player in the HME industry," says a staff member, "but our role in the lives of our customers is significant. The positive impact we have in the community is immeasurable, and that impact is a direct result of Randy Wolfe's commitment and dedication to providing the best home care." "HomeCare is proud to acknowledge those whose tireless efforts serve to further the goals of providers and the industry at large," says Editor-in-Chief Gail Walker. "The HomeCaring Awards are only a small token in recognizing the contributions of so many individuals whose exemplary service have made the homecare community a better place, and who challenge the rest of us to do better ourselves." LEXINGTON, Ky. - Mike Marnhout was just a kid when he learned the business principle that guides him today as President and CEO of Bluegrass Oxygen. 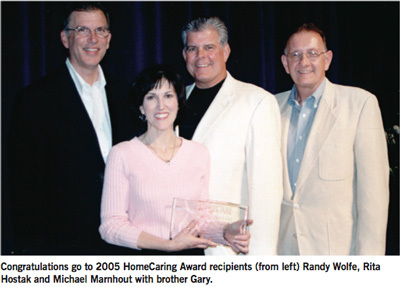 "My mom was a hospital administrator, and we learned about patient care from the very beginning," Marnhout says. "You take care of all patients, regardless of whether you get paid for it or not. Always have and always will." Marnhout admits it's gotten tougher to adhere to that principle in today's reimbursement climate. He's about 60% dependent on Medicare, so he's now getting creative in his business model. The most significant change has been to provide all of Bluegrass Oxygen's respiratory patients, about 2,400 across the company's six locations, with a portable oxygen concentrator (POC) with their stationary concentrator at set-up. Patients love it, which has led to a 15% boost in referrals. "It's a huge investment vs. tanks, about seven to eight times greater," says Marnhout. "But in the long run, the dollars you save in labor, gasoline, insurance and all, you have to change your model to survive what's happening in this industry." Bluegrass Oxygen's POC strategy differentiates the company in its target markets, and it's a focus of the company's successful marketing campaign. Marnhout stars in the company's 15 and 30-second TV commercials. Wheel of Fortune and Jeopardy are his most effective placements. He also places newspaper ads in select markets. Bluegrass Oxygen is the 10th business Marnhout has started over his 32-year career. He started this company in 1996 with one business partner, VP/COO Craig Coleman, and has grown it to a 45-employee operation, that services 100 counties in six states. Some of his service area includes urban areas like Lexington, Louisville and Cincinnati, but about 35% includes rural areas in Eastern and Southern Kentucky. "You might drive 80 miles one way," Marnhout says. "You don't want to go that far two or three days a week." Other changes Marnhout has made to his business model have included outsourcing his billing and IT functions, using GPS technology for drivers and reducing his inventory load. Now he's focusing on the changes that accountable care organizations (ACOs) will bring. He believes HME providers must do more to educate patients and referral sources about their role in that care model. Just like his mama taught him, Marnhout insists only patient-focused providers will survive. "We live, eat and breathe patient care," he says. "That's how I was raised. If you're able to, you should."